Deputy Foreign Minister Tzipi Hotovely says conflict with Arabs 'young' compared to other conflicts with lasted centuries. Deputy Foreign Minister Tzipi Hotovely met Thursday with with Greek counterpart, Georgios Katrougalos, at the trilateral summit between Cyprus, Greece, and Israel. 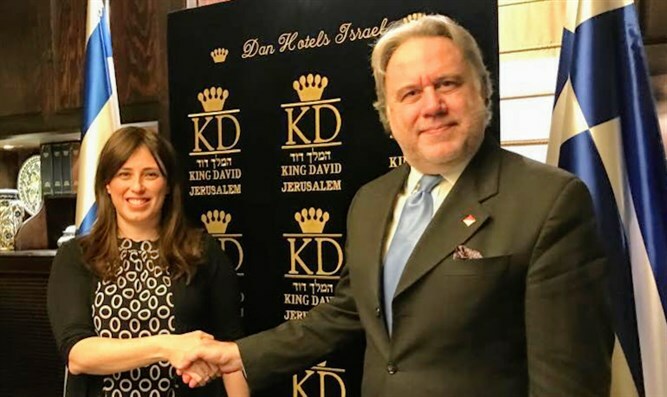 Hotovely stressed the importance of the summit and relations between the three countries, which she said serve as an "anchor of stability" in the region. She also praised the "special relationship" between Israel and Greece. Addressing the French initiative to hold a conference to restart the stalled peace process, she said that the PA had worked to internationalize the Arab-Israel conflict and called on the PA to show some responsibility instead of placing all of the hard decisions on the international community. She also addressed the role the international community plays in the ongoing PA incitement to murder Jews through the generous funding without proper oversight of Mahmoud Abbas' government. "As long as the Palestinian Authority refuses to take responsibility for the education of Palestinian children, there will be no solution to the conflict." she said. "We have patience. Our conflict is young. Some conflicts in Europe were resolved only after hundreds of years. In the meantime, Israel will continue to develop in the fields of economics and technology and strive for its next Nobel Prize."